We left California behind and moved north up the coast of Oregon. Said to be one of the most beautiful drives in all the continental US. And though I haven’t driven much around the eastern US, this certainly is worth putting on a bucket list. Every bend makes for such majestic views, the urge to stop is overwhelming. I intentionally scheduled this portion of our trip to stretch out over about 3 days. This way I wouldn’t have to drive more than 100 – 150 miles a day and we could enjoy the coast. This still was not enough time. So many view points, state parks, and sites to see. Unfortunately, I was not able to stop and see them all. I guess that’s a good excuse to go back? I wanted to make it to our campground before the sun went down. Get set up, find something to eat and enjoy the sunset over the water. 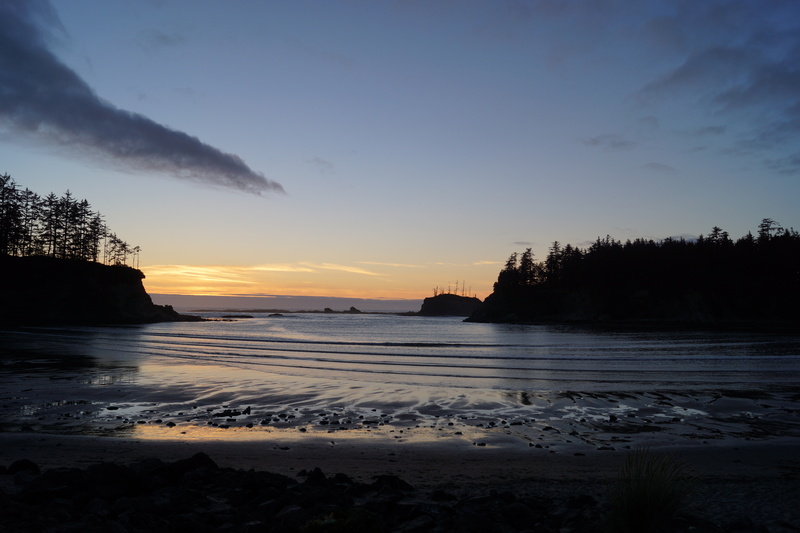 After all, we were staying in Sunset Bay State Park. I figured that name had to have some sort of meaning. What an amazing spot to watch the tide roll in as the sun kisses the horizon. Super clean campgrounds with showers (if you like that kinda thing), and nicely secluded sites. When we woke up, we had time, so we decided to explore more of the park. After scanning the map the ranger gave me, I was intrigued to hike up to some WW2 bunkers. And what a pay off it was. Literally one of my favorite parts of our entire vacation. This place is a gold mine and I HIGHLY recommend a visit just for an evening sunset and morning hike to the bunkers. It’s a 1/2 mile hike at sea level and we were the only ones there the entire time. Also, Nonnie’s Breakfast Barn is totally worth stopping in for a bite. Awesome service and food, the breakfast is priced great and is amazing. 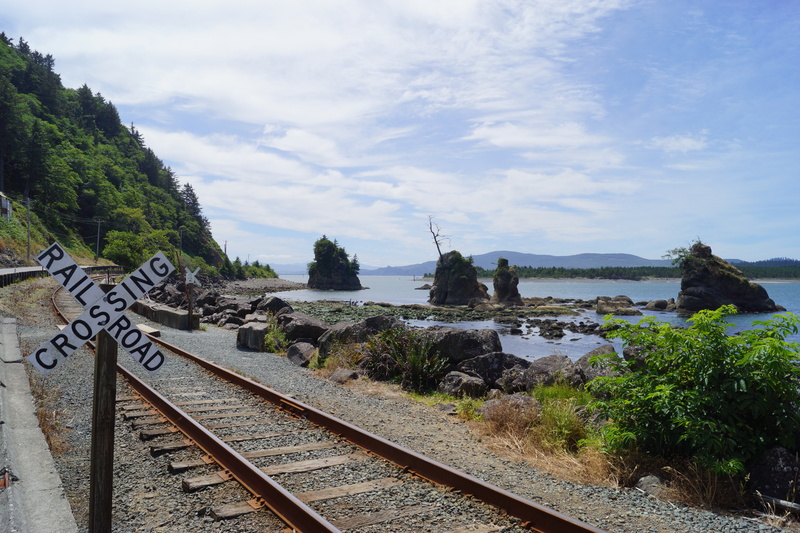 We continued on north up the coast seeing so many rock lined shores. Stopping at the Sea Lion Caves, an obvious tourist trap. But my boys really wanted to see it. And though it was cool, I wouldn’t recommend spending the $15 per person for a 30 minute cave drop. 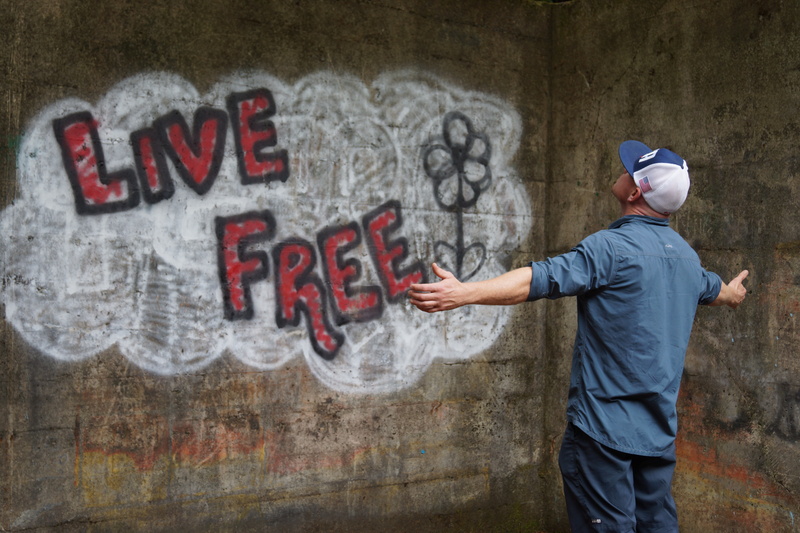 So much more to see off the beaten path. That evening we were staying in a beach side (literally) hotel. 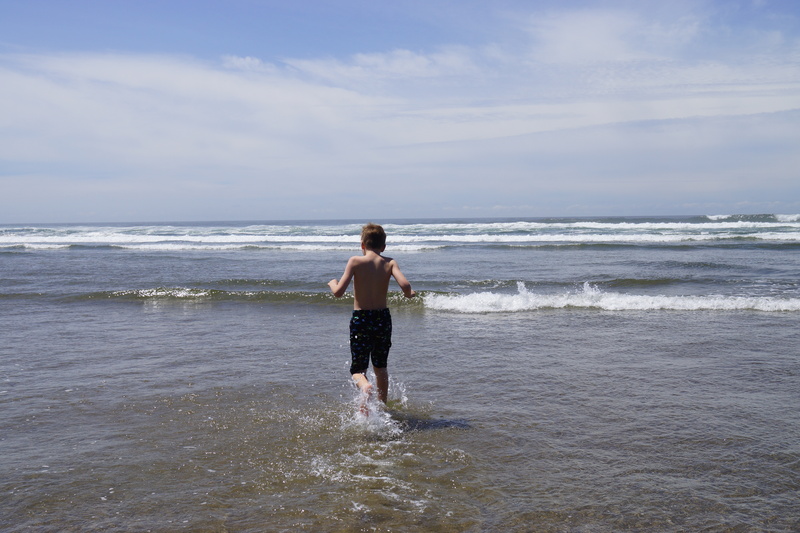 So we checked in and the boys immediately put on the swim trunk grabbed towels and bolted for the icy waters of the upper pacific. I decided it was a good time to relax and watch from the window as Kemry buried Caelan in the sand. Unfortunately, the third day was the 4th of July. Normally this would seem awesome, except I scheduled us to be in Portland area that night, so stopping to see fireworks wasn’t really an option. And traffic was so bad, I didn’t even dare pull over in many places. When I did stop at Canon Beach, the place was packed with about 300+ people. So we pushed on to the farthest north point of the Oregon coast. 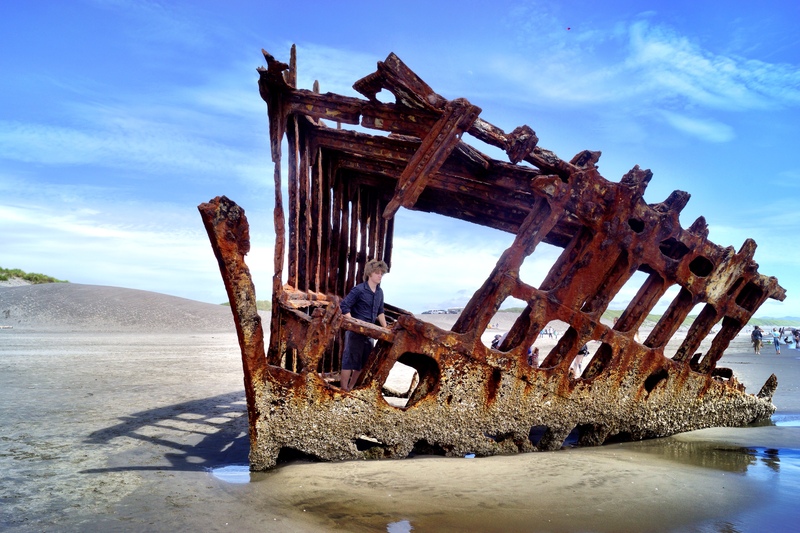 Stopping in Hammond at Fort Stevens State Park to see the Shipwreck on the beach. A gem I never knew anything about. And another great example of how Mother Nature reclaims what is hers. 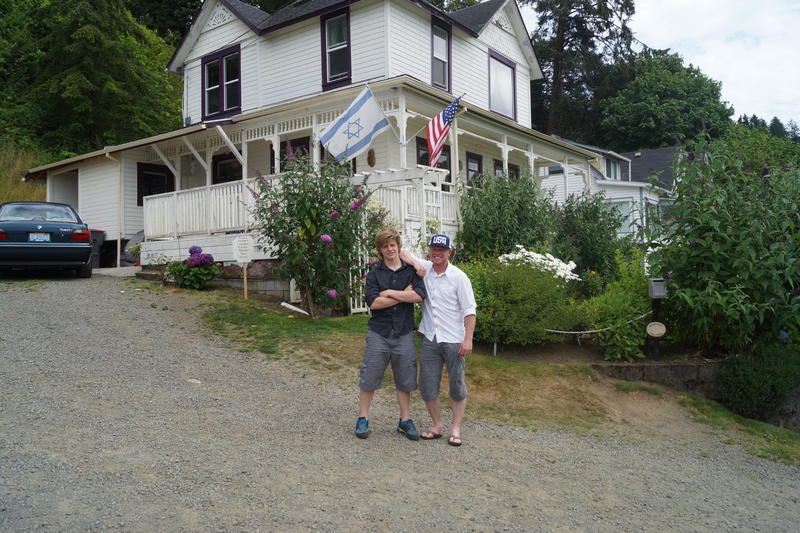 We stopped in Astoria long enough to see “The Goonies” house, which is easy to find and they welcome walk up sight seeing. If you grew up the 80’s, you certainly understand my reasons for stopping. Caelan even asked where all the “booty trap” stuff in the front yard was? When you look at it, you can definitely still see a resemblance. We didn’t have much time to spend in Astoria, so we cruised on to Vancouver, Washington. It’s just across the Columbia river from Portland, and was a lot more affordable to stay in a nice hotel on the river front. Where we could watch the fireworks from that evening. they even had a live band, BBQ and a beer garden.